Ottoville’s Alexis Sanders (6) dribbles the ball as Lima Central Catholic’s Allison Young applies pressure on defense in the first half during the Division lll district semi-final match at Ottoville High School Wednesday. Lima Central Catholic’sAvery Rice (left) Ottoville #21 Haley Hoersten (middle) and Ottoville #6 Alexis Sanders (right) try to control the ball during first half action during the Division lll district semi-final match at Ottoville High School Wednesday. Spencerville’s Raigan Staup (10) tries to make the steal from Kalida’s McKenna Bockrath (12) in the first half during the Division lll district semi-final match at Ottoville High School Wednesday. The game went into double overtime and a shootout and the results were unavailable at press time. 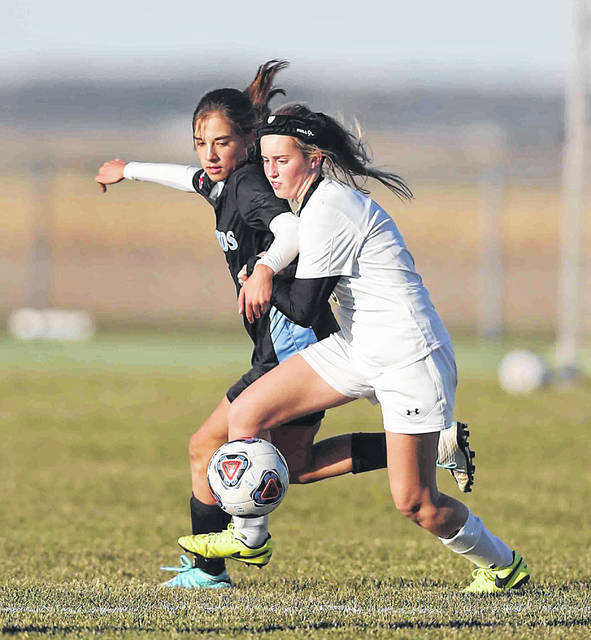 OTTOVILLE – Lima Central Catholic’s girls soccer team seems to be hitting its stride. That was shown in its contest versus Ottoville in Division III District action Wednesday afternoon. The Thunderbirds controlled most of the contest in a 5-0 victory. The Big Green had its shots on-goal in the first half – all three of them for the match. At 30:40, freshman Alyson Saxton’s 12-yarder from the left wing was denied by LCC’s sophomore goalkeeper Kitt Siatkosky. At 25:40, Nicole Knippen’s 20-yard shot was gobbled up by Siatkosky. The Big Green’s last shot on-goal of the match came at 6:10 as Kasey Knippen’s try from the right side was turned back by the goalkeeper. LCC began to assert its control of the proceedings as the first half wore on. At 22:01, Jenna Rose fired a 15-yarder that Big Green keeper Ashlee Landin (9 saves versus 14 shots on-goal) turned back. Their next shot found its mark. At 16:45, Annika Wilker fired a 20-yarder from the middle over the top and into the back of the net for a 1-0 scoreboard. At 8:50, LCC had a chance to go up by two goals as Jessica Wilker tried a 30-yarder that Landin deflected off the left post and finally got control. At 7:21, LCC went up 2-0. Annika Wilker again found the mark, knocking home a 25-yarder from the middle. The Thunderbirds dominated the second half in shots on-goal 8-0. With their defense putting the clamps on the Ottoville offense, they could pick apart the clearly tiring Big Green as the second half went on. With 33:24 left in the match, Jenna Rose went over the top from 22 yards and into the back of the net for a 3-0 lead. At 28:31, LCC’s Sophia Santaguida made it a 4-0 contest. Outside the right post, she went opposite 18 yards out. Finally, at 6:21, Avery Rice – off of a steal deep in the Ottoville defensive end – got control and beat Landin from 12 yards to the right side. The Thunderbirds (11-5-1) advance to take on Kalida at 5 p.m. Saturday. 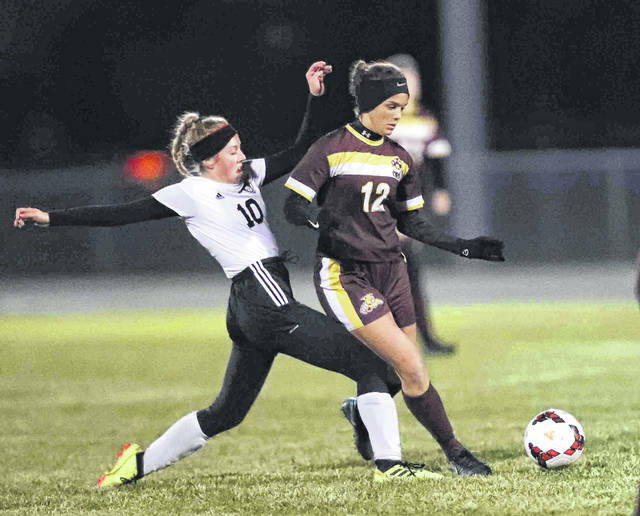 https://www.limaohio.com/wp-content/uploads/sites/54/2018/10/web1_LCC-Girls-Soccer-vs-Ottoville-DS2.jpgOttoville’s Alexis Sanders (6) dribbles the ball as Lima Central Catholic’s Allison Young applies pressure on defense in the first half during the Division lll district semi-final match at Ottoville High School Wednesday. https://www.limaohio.com/wp-content/uploads/sites/54/2018/10/web1_LCC-Girls-Soccer-vs-Ottoville-DS5jpg.jpgLima Central Catholic’sAvery Rice (left) Ottoville #21 Haley Hoersten (middle) and Ottoville #6 Alexis Sanders (right) try to control the ball during first half action during the Division lll district semi-final match at Ottoville High School Wednesday. 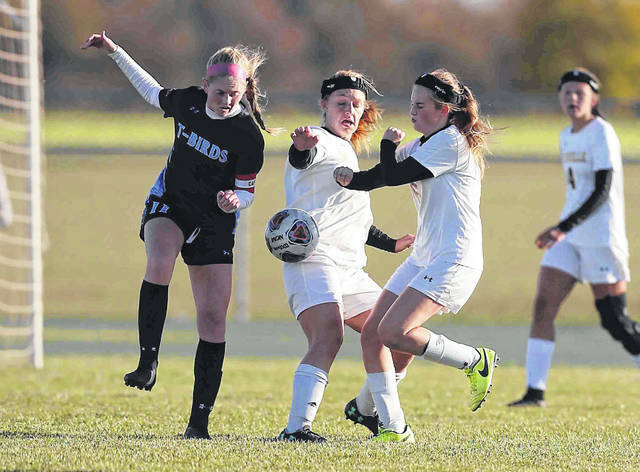 https://www.limaohio.com/wp-content/uploads/sites/54/2018/10/web1_Spencerville-girls-soccer-vs-Kalida-DS4.jpgSpencerville’s Raigan Staup (10) tries to make the steal from Kalida’s McKenna Bockrath (12) in the first half during the Division lll district semi-final match at Ottoville High School Wednesday. The game went into double overtime and a shootout and the results were unavailable at press time.